Augmented Reality, SEO's Next Frontier? Home > SEO Copywriting > Augmented Reality, SEO's Next Frontier? Dixon Jones wrote a guest blog post at the adCenter Blog on Augmented Reality and SEO. He said, imagine the world with people wearing glasses that add a layer of information to what you are seeing in front of you. For example, you walk down the street and as you walk, you get data streamed to your glasses that show you geo-specific information about where you are walking. The information can be things like the current list of movies and movie times at the theatre in front of you, or the current prices of eggs at the supermarket or an advertisement with a coupon for $1 off a cup of coffee or maybe landmark information? 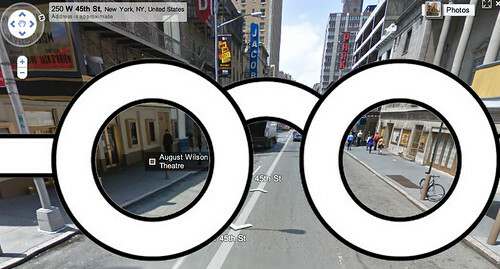 Ironically, Google launched data overlays on Street Views this week. So I decided to paste fake glasses on a picture so you can visualize it. Here's where the SEO comes in. The café owner wants you to stop at his café - regardless of the glasses and software you are running. He can train his team to be characters in the game player's dragon sequence, he can set up some data boards by the waterfall about the different theories on the evolution of the waterfall and mark these as further reading in the two pairs of glasses of the archaeology program and the Intelligent design program and - of course - I am sure he will be able to buy the ad-space to tell people that he has a café just over the brow of the cliff. Only one of these four channels to market represents PAID search marketing as we understand it today. The other three will fall into the SEO category, influencing what the user sees, whenever they search in a related situation. They are all searching within alternative virtual universes, yet the café owner can still find a way to get the user off the bus and into their café.